The fifth edition of the Shubbak Festival starts on the 28th June bringing exciting, bold, poignant and urgent work by Arab artists questioning the norm to London’s stages, concert halls, cinemas, outdoor locations, galleries and museums. In times when political alliances are shifting, definitions of gender are broadened, divisions between generations are interrogated, and hierarchies of power are exposed, the voices of these artists take audiences to new and unexpected realms of possibilities, a realm where empathy and freedom dares to live. Other highlights include contemporary belly-dance, drag and Middle Eastern avant-pop electronica from Lebanese performer Mo Khansa; Kabareh Cheikhats from Casablanca reinventing traditions of drag and gender ambiguity; X-Adra featuring Syrian activists who have been held in the notorious Adra prison; a tribute to the much loved Palestinian singer, songwriter and activist Rim Banna, who died aged 51 in 2018; the latest show from Groupe Acrobatique de Tanger; a pop-up created by Bricklab, Jeddah-based designers of the first Saudi pavilion at Venice Architecture Biennale; French-Moroccan journalist, commentator and Prix Goncourt-winning novelist Leïla Slimani discussing what it means to be an Arab feminist in 2019 and the UK premiere of the debut documentary ‘Of Sheep and Men‘ by multi-award winning Algerian director, Karim Sayad. The Gate Theatre will be home to a diverse range of ground-breaking artists and productions, many of whose work has never been shown in the UK before, alongside a day of play readings by leading MENA playwrights. Award-winning Palestinian actorAmer Hlehel, the actor and writer of five-star Taha (Shubbak 2017, Young Vic) transforms poet Qassim Haddad’s powerful contemporary rendering of the classic love story of Majnun Layla into a live experience. Chronicles of Majnun Layla, a story of boundless love, mythical passion, eroticism and desire, often described as the Arab Romeo and Juliet, is radically reinterpreted with an original soundscore and accompaniment from Rihab Azar and Kareem Samara on electronic and acoustic oud. In two bold explorations of queerness Palestinian / Danish / US-based artist Mette Loulou von Kohl delves into her infatuation with Palestinian freedom fighter, hijacker and icon Leila Khaled in No One Likes An Ugly Revolutionary and writer, professor, actor and spoken word artist Dima Mikhayel Matta draws a searing picture of her queer existence in relation to Beirut in this is not a memorized script, this is a well rehearsed story. ēvolvō and other works is a magic visual delight from one of Beirut’s freshest young talents, Yara Boustany. Conjuring up complex and wondrous images and optical illusions, ēvolvō follows a journey from idyllic nature in the mountains of Lebanon, filled with birdsong and the buzz of insects, to the busy street life of Beirut with its startling roofscapes and noisy traffic. The city is haunted by animal spirits. ēvolvō is performed alongside the shorter work One Day and One Night Beirut. A Creative-Europe Shubbak co-commission with five European partners Under A Low Sky by Wael Ali, a leading Syrian writer, dramaturg and director now based in France, is the story of 40-year-old Syrian cinematographer, Jamal, who is obsessed with the idea of losing his past. He has been living in France for more than a decade and is now confronted by so many places from his memory being abandoned or destroyed, and his friends being scattered all over the world. In order to reconnect with his present life he starts researching the period of the birth of the Syrian state in the early twentieth century. At Sadler’s Wells, Lebanese choreographer and performer Ali Chahrour makes a rare UK appearance. Part of a trilogy exploring mourning rituals, may he rise and smell the fragrance is a dance performance and ceremony where death in all its primitiveness emerges from the depth of the earth to become a rite for life. At the Southbank Centre, Shubbak & Crying Out Loud present Halka by Groupe Acrobatique de Tanger, in partnership with Abu Dhabi Festival. Halka, the latest production from this hugely popular North African company, is a homage to their home city, Tangier. Halka, the Arabic word for the circle formed by a crowd gathered around street performers, goes right back to the roots of their lives and works and is the first production the group has directed as a collective. Also at the Southbank Centre Tunisian dancer Mohamed Toukabri’s autobiographical solo The Upside Down Man (the son of the road) delves into the experience of a young man finding himself in dance and in Europe. The piece follows him from discovering street dance as a 12-year old in front of the railway station in Tunis to his ten years of performing with renowned companies like Anne Teresa De Keersmaeker, Sidi Larbi Cherkaoui, and Jan Lauwers. Moroccan artist Youness Atbane’s The Second Copy 2045 is set in 2045, a time when current conflicts have ended, and artists’ archives become a source of knowledge for a new generation. Atbane’s performance at the British Museum features in a new documentary film by a young film maker about the history of Moroccan art and the role of the artist in the early 21st century. The film includes footage of the very performance we are watching. With lucid clarity and deadpan humour, The Second Copy takes a look at the dynamics of contemporary art, the role of institutions and the telling of history. Battersea Arts Centre is the venue for X-Adra. Ayat, Hend, Ali (formerly Ola), Mariam, Rowaida and Kenda are Syrian activists who have been held in the notorious Adra prison. Using their own words, each person takes us right into the heart of prison life. They speak of the strengths they drew on to survive and their determination to resist. Their personal stories are of violence and pain, but also of solidarity, hope and an unshakable faith in freedom. Directed by Syrian actor / director Ramzi Choukair and dramaturg Wael Kadour accompanied by the haunting sounds of Hala Omran. Ramzi Choukair, who performed in the National Theatre production of ‘Salome’ in 2017, is an actor and director based in Marseille. Shubbak 2019 officially opens at Rich Mix with the second edition of Kahareb, a groundbreaking electronic showcase presented by MARSM. Bringing together the finest selection of artists from the Middle East and North Africa, Kahareb celebrates the vibrant underground scenes of techno, folktronic, global bass, house, trance and more. Featuring Sama’ (aka. Skywalker), a DJ and electronic music producer from Palestine; Shkoon, who mixes Arabic scales, melodies and traditional folk songs with classical harmonic; Nuri, one of the upcoming promising musicians of African futurism, and from Morocco Glitter, who combines her chaabi roots with her razor-sharp electronic selection. From Beirut comes Mo Khansa: multi-genre musician, performer and aerialist. Contemporary belly-dance, drag, aerial work, Middle-Eastern avant-pop electronica all meet in a genre-defying performance exploring identity, sexuality and emotional vulnerability. From Casablanca comes the most surprising hit of recent years: Kabareh Cheikhats. Led by theatre director Ghassan El Hakim, 11 actors and musicians pay tribute to Morocco’s most famous female traditional folk singers. Both adored but also stigmatised, the cheikhats had an ambiguous position in society. 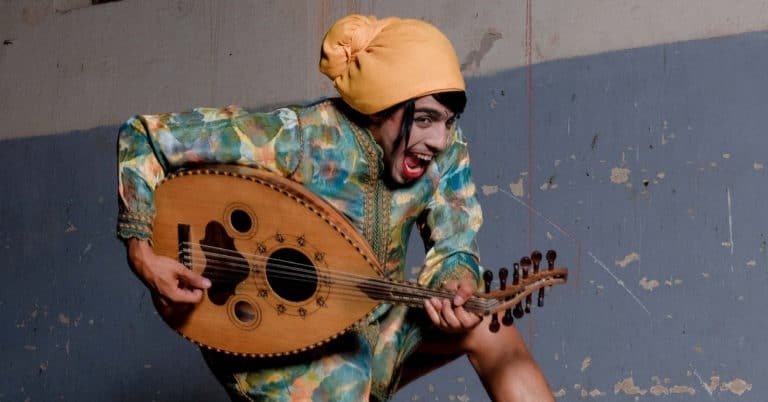 With deep reverence yet wild and infectious flair Kabareh Cheikhats sing, dance and re-enact these powerful songs once again: songs of love, rebellion and fierce independence using traditional costumes, make-up and instruments and re-inventing traditions of drag and gender ambiguity. At Sadler’s Wells trumpeter, composer, and santur player Amir ElSaffar brings flamenco and Arabic maqam together in Luminiscencia combining electronics, strings, and ElSaffar’s trumpet with the voice, dance rhythm, and duende of flamenco. Presented in partnership with Abu Dhabi Festival and Flamenco Festival London. The Barbican hosts The Trace of the Butterfly, a special tribute concert to the prominent Palestinian singer, songwriter, composer and activist Rim Banna, who died aged 51 in 2018, featuring a collection of her peers and admirers including: Lebanese singer-songwriter Tania Saleh; Palestinian composer and pianist Faraj Suleiman; and Syrian MC and hip hop producer Bu Kolthoum. Produced by MARSM. For 2019 Shubbak has commissioned a number of mobile installations for different locations across London. Aicha El Beloui is a Casablanca-based illustrator, graphic designer, and creative director who regularly works with communities to discover a neighbourhood and to filter her observations into maps and illustrations. The history and psychogeography of Moroccan immigration in London will be the focus of her work for Shubbak; drawing from the material gathered in North Kensington and the British Library’s archives, El Beloui will create one of her distinctive maps, which will be available in paper formats, digitally and as an installation, travelling to different sites across the city. Bricklab, the designers of the first Saudi pavilion at Venice Architecture Biennale create a new pop-up sculpture especially for Shubbak. 22 brightly coloured units equalling in number the 22 states of the Arab League are arranged in different constellations to offer new viewpoints of geographies, nations and the power to imagine other realities. No unit can stand on its own, but has to be grafted onto others. Geographical Child’s Play conjures up poignant and surprising alignments and dependencies. Established in Jeddah in 2015 Bricklab quickly established itself as one of the most dynamic current design practices in Saudi Arabia. Becoming by Tunisian artist Hela Ammar, is a new site-specific photographic installation in Shepherds Bush Market. Ammar spent time with women who have recently arrived and are carefully balancing the normality of London living with a period of personally unsettled existence. Memory, identity and marginal communities are recurrent themes in Ammar’s work. She has exhibited in major international biennales and her works are in the collection of the British Museum and the Institut du Monde Arabe. Nicknamed Petit Larache, Golborne Road in North Kensington has long been at the centre of Moroccan identity in London. Casablanca-based street artist and key member of Morocco’s thriving art scene Mehdi Annassi, aka Machima, will work with residents and community groups to create a mural that reflects its history and scenes of everyday life. Presented in partnership with Bagri Foundation. Moroccan artist Hicham Berrada’s kaleidoscopic sculptures, installations, video and performance works offer a heady combination of art and science. For his solo exhibition in Hayward Gallery’s HENI Project space – his first in a UK institution – Berrada brings together new and existing works, including a series of illuminated tanks that feature delicate and ephemeral chemical landscapes, and a large-scale immersive video installation that explores morphogenesis, the biological process that causes an organism to change shape. At Rich Mix Belonging, Sideways curated by Toufik Douib sees five Algerian contemporary artists explore identity and location. Artists include Mounir Gouri, Sarah Ouadah, Rima Djahnine, Fethi Sahraoui and Abdo Shanan. In his first solo presentation in the UK, Saudi artist Nasser Al Salem presents Amma Baad (There After) at the Delfina Foundation, exploring the relationship between language, time and space through a series of sculptural and multi-media work of the wordsThere After in Arabic script. Amma Baad (There After) is an expression used in official correspondence which follows sentences of salutations and greetings and precedes the act of formulating the story to come. Curated by Maya El Khalil. Curated by Yasmina Naji, Raw Queens at the Mosaic Rooms offers a cultural and political re-evaluation of the perception of women in the Arab world, specifically in Morocco. Featuring artists Fatima Mazmouz and Meriem Bennani, the exhibition explores art, feminism and decolonization. Raw Queens is produced in collaboration with The Mosaic Rooms. At the British Museum the symposium Making art in Yemen and Syria today brings artists, curators and scholars together to investigate the current status and future of art and culture in these troubled countries. Produced by British Museum in collaboration with Atassi Foundation for Arts and Culture. Following on from Shubbak’s first ever queer literary panel in 2017, Bold Voices: New Queer Writing brings together a new range of writers and artists working at the cutting edge of LGBT+ creative expression. Three artists from this exciting and defiant scene present their multidisciplinary approach, ranging from comics to storytelling, memoir and activism. Lebanese poet, playwright and actress Dima Mikhayel Matta, the founder of Beirut’s storytelling platform Cliffhangers, British-Iraqi non-binary writer, drag performer and filmmaker Amrou Al-Kadhi, and Joseph Kai, whose comics centre around the unspoken, marginalization and gender. Telling the past: Contemporary Arabic Historical Novels features a range of writers who approach the recasting of fraught histories through the creative lens discussing the motivations, methods and challenges of this special genre. Reading from their work in Arabic and in English are Iraqi multidisciplinary writer Inaam Kachachi, shortlisted for the IPAF 2019; Iraqi-Welsh journalist and writer Ruqaya Izzidien, whose debut novel features Iraqi, Welsh and English characters in WWI Baghdad; acclaimed Sudanese novelist Hammour Ziada’s newest work examines cycles of patriarchal and political oppression through twentieth-century Sudan; and London-based Palestinian novelist Rabai al-Madhoun, whose epic Destinies, Concerto of the Holocaust and the Nakba on the Palestinian exodus and right to return won the IPAF 2016. Three feminist artists from very different contexts, working in diverse artforms, discuss and perform their work and what it means to be an Arab feminist in 2019. French-Moroccan journalist, commentator and Prix Goncourt-winning novelist Leïla Slimanijoins the Saudi journalist, chatshow host and novelist known for tackling women’s issues for over twenty years Badriah al Beshr, and the Egyptian creator of the veiled female superhero Qahera, multi-award-winning graphic novelist and web comic artistDeena Mohamed for The Endless Wave: Feminist Writing Now. Three special ‘Spotlight’ sessions focus on new or forthcoming books: Arabic writing from London with Malu Halasa, new Syrian fiction with Dima Wannous and groundbreaking new translations of Kurdish fiction with Bakhtiyar Ali and Kareem Abdulrahman. Tongue Fu is one of the UK’s leading spoken word and music shows, rocking their audiences at Rich Mix for the last ten years. For Shubbak, Tongue Fu presents a very special guest night featuring Arab spoken word artists working across and between the two languages. Amerah Saleh is a Yemeni artist from Birmingham. Co-Founder of Verve Poetry Press and member of Beatfreeks Collective. Claudine Toutoungi’s poems have appeared in Poetry Chicago, The Guardian, The Financial Times and The Spectator, and her debut poetry collection is Smoothie (Carcanet, 2017). Farah Chamma is a Dubai-born Palestinian performer who writes and performs poetry in Arabic, English and French. And Dutch-born of Moroccan origin, Samira Saleh is a rising star on the European slam poetry scene. Curated and produced by BAFTA-nominated curator and producer Elhum Shakerifar (A Syrian Love Story, 2015), Shubbak’s film programme looks to questions of identity, nationality and notions of borders through a superb selection of recent titles, including several UK premieres, five ScreenTalks and a panel discussion around Arab-British identity. Films include multi-award-winning ‘Sofia’ by Meryem Benm’Barek (2018), a shrewd look at the class divide told through the prism of a young Moroccan woman who unexpectedly finds that she is pregnant; Claire Belhassine’s ‘The Man Behind the Microphone’ (2017) a documentary by about her grandfather Hedi Jouini, known as the ‘Frank Sinatra of Tunisia’ – the most popular musician in Tunisian history and Sofia Djama’s accomplished debut feature ‘The Blessed’ (2017), set in the heady Algerian capital, where an interconnected cast of characters reveal very different imaginations for the country’s future over the span of 24 hours. Every summer, the National Theatre puts on a free outdoor arts festival outside its doors right on the south bank of the Thames. This year, Shubbak takes over the stage for a weekend, offering a rich and varied programme of music, performance, workshops and installations. Mixing family activities with music bands, spoken word and late DJ sets, the programme brings the best of London’s and international Arab cultural scene to this free and iconic setting. Presented in partnership with AMAL (A Saϊd Foundation Programme). Shubbak on Tour will see the following productions and installations tour to other venues outside London: Chronicle of Majnun Layla, Halka, The Upside Down Man (the son of the road), ēvolvō and other works and Bricklab’s installation Geographical Child’s Play. Shubbak is the UK’s premier festival of contemporary Arab culture, presenting outstanding Arab artists to audiences in London and across England. Shubbak’s programme includes UK premieres and new commissions from over 150 artists based in the Arab region, in Europe and in the UK, with both cutting-edge and celebrated names, through a mix of visual arts, film, music, theatre, dance, literature and debates. Led by Eckhard Thiemann, artistic director, and Daniel Gorman, executive director, Shubbak 2019 is the 5th edition of this biennial festival. Shubbak 2019 principal partners are Arts Council England, A. M. Qattan Foundation, Bagri Foundation and British Council. Shubbak is a registered charity number 1150374.